Japan have become the first team to defeat a South American team in a World Cup match, according to the commentator on the TV. It has took 18 attempts to get this win, and there was a stroke of luck involved but Japan and Asia will take it anyway. Japan defeated Colombia 2-1 getting a little bit of revenge for their 4-1 defeat which happened 4 years ago in Brazil. Japan’s two goals were scored by Shinji Kagawa and Yuya Osaka. Japan got a massive stroke of luck when Colombian defensive midfielder Carlos Sanchez had a brain fart and decided to hand-slap the ball to stop it from going in Colombia’s net. This was only the third minute of the match making it the second fastest red card at a world when he was given his marching orders. Shinji Kagawa stepped up and tippy tapped the ball straight down the middle of the goal, luckily the Colombian keeper decided to dive which meant this left Japan 1-0 up and having a man advantage. This might have come as some justification for the JFA’s (Japanese Football Association) decision to replace Halilhodzic with Nishino, as Halilhodzic was trying to change the Japanese playing style to replicate that of others and we saw how that worked for South Korea when they tried to replicate Tottenham. Nishino had Japan knocking the ball around nicely and playing a very technical game and this started to show in the second half when Japan looked to ram home their man advantage. They were huffing and puffing but Colombia’s house was refusing to be blown down. 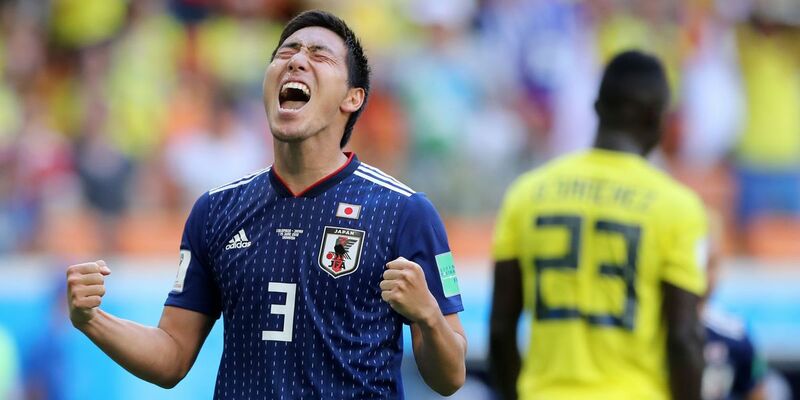 Japan continued to pile the pressure on Colombia throughout the second half, and eventually managed to break through the Colombian rearguard. Yuya Osaka scored an excellent header from a corner, in a crowded penalty area he managed to get up and nod it in to put Japan in front. At this point Colombia looked knackered, with Japan knocking the ball around nicely it looked like they’d stroll to a win but Colombia tried to put some pressure on near the end and Japanese fans experienced squeaky bum time. Japan held on and secured a historic result for themselves and all of Asia. This can be shown as a blueprint to other Asian nations to stop trying to replicate styles of South American or European teams and concentrate on playing their own game. We know Japan got a big slice of luck with the sending off but they still had to do the business and even with ten men Colombia are still a very good and dangerous side to play against. Asian countries need to develop their own playing style and they’ll start to win more games against stronger opposition.